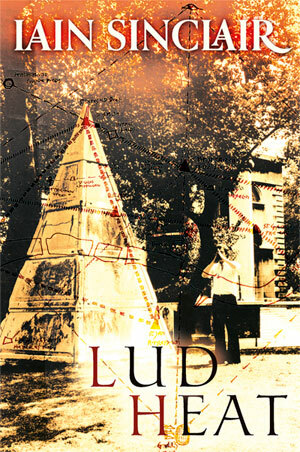 Iain Sinclair’s classic early text, Lud Heat, begins by exploring mysterious cartographic connections between the six Hawksmoor churches in London moving on to various subterranean morphologies. In a unique fusion of prose and poetry, Sinclair invokes the mythic realm of King Lud, who according to legend was one of the founders of London, as well as the notion of psychic ‘heat’ as an enigmatic energy contained in many of its places. The book’s many different voices, including the incantatory whispers of Blake and Pound, combine in an amalgamated shamanic sense that somehow works to transcend time. The transmogrifying intonations and rhythms slowly incorporate new signs, symbols and sigils into the poem that then further work on the senses. This was the work that set the ‘psychogeographical’ tone for much of Sinclair’s mature work, as well as inspiring novels from his peerage, like Peter Akroyd’s Hawksmoor, Michael Moorcock’s Gloriana and Alan Moore’s From Hell. In the same essay Sheppard makes the connection between Sinclair’s style and what had been lately going on in the American poetry scene, as others have been keen to do. The case for prose-poem hybridity extending from Ezra Pound’s Cantos down to us through William Carlos Williams’ variable verse has been made often, notwithstanding that such also has a precedent in ancient Greece and the European poetic traditions made prominent by Charles Baudelaire. The influence of Charles Olson, specifically the Maximus Poems, is indubitable in Lud Heat – especially as the author makes mention of the American poet on various occasions throughout the text. Although Olson was not prone to quite as much prosody Sinclair makes use of the spontaneous breath-unit type lines found in his stylized ‘projective verse.’ This improvisatory journal feel keeps the writing fresh and perceptive as if the lines were written within moments of the experience – apt for a sort of psychic travelogue. But Sheppard also points out that Sinclair operates within a fairly well entrenched British tradition, following Roy Fisher’s Birmingham City, Lee Harwood’s Cable Street, Chris Torrance’s The Magic Door (also first published by Sinclair’s Albion Village Press) and Allen Fisher’s Place Project. Lud Heat is the first of many works that reflects Sinclair’s penchant to roam and record, later producing the sort of roving, psychic travelecritudes for which he became famous, namely Downriver, London Orbital and Edge of the Orison. This led to him being shunted, often to his chagrin, under the ‘Psychogeography’ umbrella along with such contemporaries as Peter Ackroyd, Patrick Keiller, Alan Moore, John Mitchell, Walter Benjamin, J.G. Ballard, Will Self and Robert Westerby. Although the term comes down to us through European avant garde theory the above writers seemed more enamoured with such place-driven British predecessors as William Blake, Arthur Machen, Robert Graves and Thomas de Quincey. Sinclair very much honours these British forebears although he is also keen to acknowledge the ‘flâneur’ ethos as expressed by Charles Baudelaire and other European writers. There is also something of a postmodern fractiousness in these early texts as the author attempts to present a discontinuous sense of self that cannot be contained in linear trajectories. The reader must encounter a labyrinthine chamber made up of writerly fragments, maps, images, psychosis, visions, hieroglyphics and architecture in order to get at some sense of the inner oracle. The land that inbounds the roving soul is not quite terra firma but shifts between points of shadowy subreference. All is flux and mutability between both ancient and modern ley lines that demarcate inner and outer points, as the writer undertakes a sort of psychic mowing of overgrown lawns, both uncovering and re-covering in the same sweep motion. Sheppard likened it to a modern adaptation of Keats’ ‘negative capability’ where the author (and by extension reader) reaches “an imperturbable emptiness rather than oracular fulfilment.” Such is the act of erasure in a world that seeks to deconstruct. But another reader may find Sinclair’s ‘heat’ to be the filling of a vacuum rather than some entropic dissipation. But beyond literary intentions Sinclair writes around his obsession for arcane knowledge and the world of the occult. The mapping and diagramming, both verbally and pictorially, operates in mirrored states between the physical and the psychological – as Allen Fisher notes in a published letter to Sinclair in Place: “Your symbolic attachment to place is not merely that place given meaning by inherent attraction, by ‘magic’, or by unaccountable attachment to soil. Nor is it solely the pyramidic structure of any of your “key” buildings . . . Your concern is energetic and about energy where the place becomes symbol of ourselves . .” What Sinclair explores is a system of occult energy that finds a variable antennae in the close and strangely juxtaposed structures of contemporary London. The channelled movement between such precarious points unleashes an energy that reaches beyond the arc of linear history to something more primordial, in essence ritually enacting a sort of spiritual dowsing. The concept of ‘ley lines’ has come a long way from the original Dodmen and The Old Straight Track of Alfred Watkins, recently fusing with ‘sacred earth science’ or the ‘earth mysteries movement’ among other entities. But the existence of sacred connective traceries in Britain’s landscape, whether by chance or by divine providence, continues to be a provocative possibility – and one that has charmed more than a few of its leading writers and thinkers. Similarly the promise of topographical amplification through the calculated placement of inspired edifices will linger long after the Egyptians turn to mummified ash. Sinclair dallies with many occulted spaces throughout the book and shows that what is hidden is often only due to the willing myopia of the beholder. Lud Heat was first published by Sinclair’s fledgling Albion Village press in 1975 with a series of provocative photos and illustrations to illustrate the text. It has since been reissued, most recently by Granta Press, as a companion piece to Sinclair’s other early piece, Suicide Bridge, but without the attendant images. This new edition seeks to restore the work to the first edition more closely representing the author’s original intentions. It includes an introduction by Allen Fisher, an afterword by Michael Moorcock, illustrations and maps by Brian Catling, and the author’s photographs. Skylight Press is immensely proud to reissue this great visionary work. As Tony Dunn aptly put it “(Sinclair) was one of a group of poets who, from the early 1970s, resuscitated the dead art of English poetry with a body of truly fiery work.” By putting this text back into print we hope to keep the flame burning bright. Lud Heat is available from various retail outlets such as Amazon, Amazon UK, or direct from the Skylight Press website. This entry was posted in British Literature, Esoteric, Literature, New books, Poetry, Recommended reads and tagged 1960s, 1970s, Alan Moore, Albion Village Press, Angela Carter, anthologies, Architecture, Arthur Machen, avant garde, BBC, Bookdealers, British Avant Garde, British Literature, British mysteries, British poetry, Cardif, Chaos magic, Charles Baudelaire, churches in london, Conductors of Chaos, Dining on Stones, documentary, Downriver, Earth Mysteries, Edge of Orison, esoteric, Euclidian, filmmaker, Flaneur, Geography, gnosticism, Gothic, Guy Debord, Hackney, Hawksmoor, hawksmoor churches, History, iain sinclair, innermost sanctuary, J.G. Ballard, Landor's Tower, Lettrists, Ley Lines, Lights out for the Territory, Literature, London, London Film School, London Orbital, London Psychogeographical Association, Louis Aragon, Lud Heat, Margaret Thatcher, Michael Moorcock, nomad, Occult, Peter Akroyd, Psychogeography, ratcliffe highway, River Thames, Robert Graves, Shamanism, Sigil magic, Situationists, Suicide Bridge, Surrealism, The Workshop for Non-Linear Architecture, Thomas De Quincey, Underground, Walking tours, Walter Benjamin, white chappell, WIll Self, William Blake, writing. Bookmark the permalink.